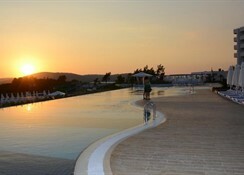 Basking in the sunshine, right by the Aegean Sea is the Amara Island Bodrum Elite. A 5-star Ultra All Inclusive haven opened in 2014 on this scenic pine island. A choice of over 500 contemporary rooms and an astonishing array of facilities for all the family. 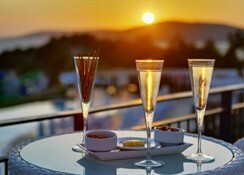 Amara Island Bodrum Elite stands by its name – the Turkish Aegean just upped its game!! It is just fab; check it out. 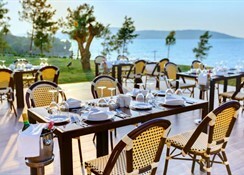 Guvercinlik village is only 3km away and the vibrant Bodrum city centre is 26km along the coast. 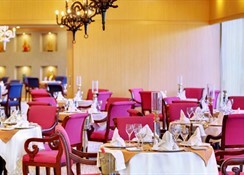 The high standard is set with the buffet restaurant, indoor with an alfresco terrace. And for special moments, a choice of 6 a la carte venues for varied cuisines; (1 free entrance and then chargeable) and there's live music. 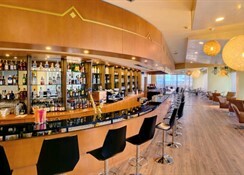 4 snack venues for lighter meals and 7 refreshment bars for pool, disco, relaxation, the beach and sports events. Some venues are 24-hour. A professional programme of shows, theme parties, live music, Night Club and Gala Nights. Pools for relaxation, activities and good-old-fashioned swimming. Young ones from 4-12 have a fully serviced Mini Club and a pool for entertainment and creative activities. 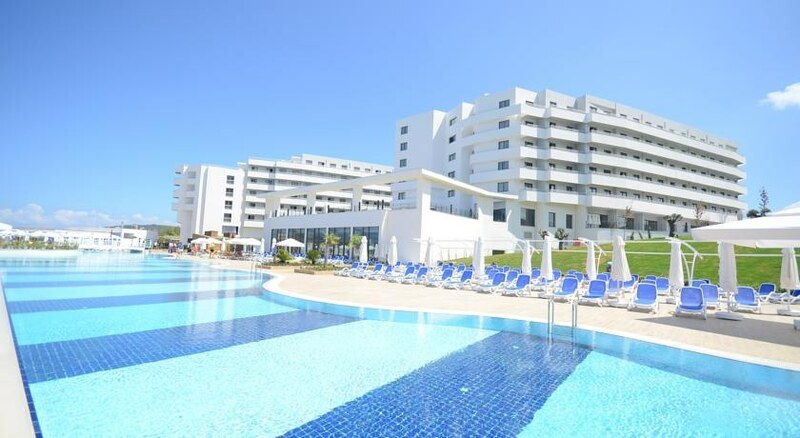 There's an incredible range of sports on land and in water, exercise classes and a fitness centre. Further water sports and personal trainer classes for a fee. The gorgeous Spa & Wellness arena will re-charge your system; therapies & treatments for a local fee. And a 150 metre long, well equipped beach will lure you away. Live the good life – oh yes. Spacious, modern and bright guest rooms. Comfy smart furnishings reside within interiors of fresh pastel tones and artwork. Seasonal air-con & heating; a wealth of entertainment media and lifestyle amenities. Slip out onto the furnished balcony and pinch yourself. Milas-Bodrum International Airport is 15km. 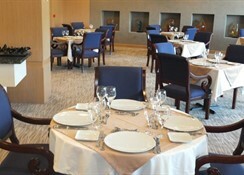 Meals:Breakfast, Buffet, Restaurant (Pina Restaurant), Daily: 07:00 - 10:00.Late Breakfast, Buffet, Restaurant (Pina Restaurant), Daily: 10:00 - 11:00.Lunch, Buffet, Restaurant (Pina Restaurant), Daily: 12:15 - 14:00.Dinner, Buffet, Restaurant (Pina Restaurant), Daily: 19:00 - 21:00.Dinner, A la Carte; Turkish, Restaurant (Mardin Restaurant); Reservations Required, Once per stay: 19:00 - 22:00.Dinner, A la Carte, Restaurant (Sima Restaurant - Asian); Charged Locally (30EUR cover charge per person); Reservations Required, Daily: 19:00 - 22:00.Dinner, A la Carte; Italian, Restaurant (Pulcinella Restaurant); Reservations Required, Once per stay: 19:00 - 22:00.A la Carte; International, Restaurant (Elegance Restaurant); Extra Charge (10EUR cover charge); Reservations Required, Daily: 19:00 - 22:00.Dinner, A la Carte; Fish, Restaurant (Vira Restaurant); Reservations Required, Once per stay: 19:00 - 22:00.Dinner, A la Carte, Restaurant (Prime Restaurant - Steak); Charged Locally (20EUR cover charge); Reservations Required, Daily: 19:00 - 22:00.Snacks, Mexican, Snack Bar, Daily: 12:00 - 16:00.Snacks, A la Carte; Italian, Snack Bar, 24 hours.Snacks, Snack Bar (Pool Snack Bar), Daily: 11:00 - 17:00.Childrens Menu, Main Restaurant (Lunch: 12.30-2pm. Dinner: 7pm-9pm), Daily.Snacks, Snack Bar (Gozleme), Daily.Drinks:Locally produced Alcohol; Locally produced non Alcohol, Lobby Bar, 24 hours.Locally produced Alcohol; Locally produced non Alcohol, Pool Bar, Daily.Locally produced Alcohol; Locally produced non Alcohol, Disco, Daily: 23:00 - 02:00.Fresh juices, Bar, Daily: 09:00 - 19:00.Locally produced Alcohol; Locally produced non Alcohol, Beer, Beach Bar, Daily: 10:00 - 20:00.Locally produced non Alcohol, Bar (Game Bar), Daily: 10:00 - 20:00.Beer; Mineral water; Tea; Coke; Lemonade; Fanta; Fresh juices, Bar (Midi Bar), Daily.